A story posted just this year (click here) has shown that bacteria found on top of soda cans can be deadly. As the story reads, the woman died of the disease leptospirosis apparently contracted from the top of a soda can. The apparent danger of drinking out of soda cans is certainly an issue that merits study. Additionally, a similar study (link) to the data to be presented here claims significant differences between cleaned and unclean cans. However, the data within the study were not presented. Here Scientific AmeriKen provides evidence regarding the cleanliness of soda cans. Checking for can cleanliness. One cotton swab was used to clean the tops of 3 soda cans. The same side of the swab was used to clean the entire top. A t-shirt was then used to wash the tops of 3 new soda cans. The two swabs were then compared against a clean swab to compare cleanliness. Measuring for bacterial content. Soda cans were either cleaned with a t-shirt or left alone. Cotton swabs were then used to clean the tops of the cans then streaked across agar plates. Additionally, a another plate was streaked with a clean swab and another was streaked with a swab that had touched a known bacterial source (lab sink). Agar plates were incubated overnight at 37oC and were then checked for bacterial growth. As seen in figure 1, noticeable dirt developes from the swabbing of 3 soda cans. Cleaning the soda cans with a T-shirt effectively reduces the amount of dirt that is seen on the Q-tip after 3 sodas. The dirt was effectively cleaned, however, it was necessary to test agar plates for potential bacterial growth. Two trials were conducted from cokes purchased from two seperate coke machines. The first test showed little difference between conditions, although the uncleaned coke contained a different bacterial colony type then seen on the other plates. 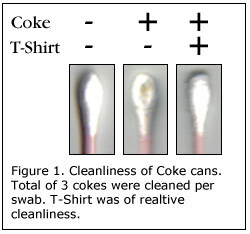 However in trial 2, large differences could be seen between coke cans that had been cleaned against those that had not. Judging from the data it appears as though cleanliness is an issue with regards to soda cans. Although not ever soda can may contain bacteria on it, it seems that one was found when only 2 were tested. Even if bacteria isn't in question, the dust found on the soda cans was also quite significant - for this reason, as well as the effectiveness of the T-shirt, Scientific AmeriKen is well convinced to clean the tops of all future drinks! Despite the apparent threat of bacteria on soda cans - it should be noted at this time that the story used to drum up interest in this experiment was actually just an internet hoax (click here). After extensive web investigation there were no verified stories of anyone getting sick drinking tainted soda cans - most likely because the amount of the bacteria on the top of the cans may not be strong enough to cause illness. Regardless of the reason, the fact that they are there is still disgusting and they should therefore be removed via T-shirt or napkin.